From Wednesday 27 March 2019 until Thursday 31 October 2019: Enjoy 15 % off! From Saturday 30 March 2019 until Monday 30 September 2019: Enjoy 20 % off! From Saturday 6 April 2019 until Monday 30 September 2019: Enjoy 20 % off! From Wednesday 1 May 2019 until Sunday 9 June 2019: Enjoy 25 % off! 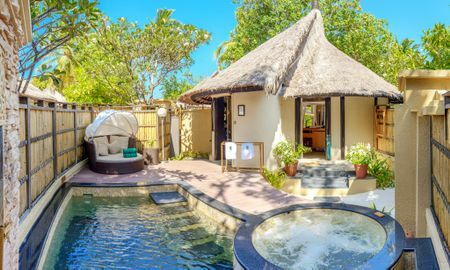 A beachfront address offering direct ocean access, a private pool with adjoining jet pool, romantic outdoor shower and a villa with charmingly thatched roof and wooden slatted pathways across sandy floor bring you to the heart of both sand and sea. A walled water feature adds an elegant touch to the pool and a broad rounded patio leading out from the plush bedroom's French doors offers al fresco dining options. With an open-concept bathroom, private poolside cabana and sheltered outdoor terrace furnished with comfortable lounge beds and a stunningly personal view of the sea's jeweled tones, this Maldives pool villa provides you with a beachfront experience that is nothing short of seafaring. At the Banyan Tree Vabbinfaru, feel the natural sea breeze sweeping in from the majestic Indian Ocean. The signature hospitality serves an intimate retreat, a sanctuary to reconnect in sheer harmony. Boasting two types of Pool Villa’s additionally with a jet pool, the paramount of comfort is transmitted in a charming ambiance that exudes luxury. Stroll leisurely in the wide-open spaces, recognising the plush bedroom's French doors opening to the wooden patio that leads to the powdered sand and an expansive wild blue ocean. Selected accommodation benefit from the refreshment of lush verdure gardens surrounded by coconut trees and indigenous blooms, a tropical outdoor shower, and a private poolside cabana and sheltered outdoor terrace, furnished with comfortable lounge beds. Cherish the opportunity to experience fine dining at the Banyan Tree Vabbinfaru resort’s exotic restaurants. The beachfront venue of llaafathi is set amidst tropical trees and a natural roof of dried grass. A bountiful spread of freshly prepared breakfast delicacies and gloriously decadent seafood dishes set the scene for a relaxed meal on an island of hushed privacy. The open-air Sangu restaurant prepares exciting barbecue buffet lunches and themed dinners under a blanketed cover of glowing stars. Reflecting the best of Maldivian charm, the drumming performance by the lively musicians create an immersive atmosphere as the extensive range of delicious appetisers, light bites and fragrant cocktails delight. Pamper and rejuvenate with a range of spa treatments formulated from ancient healing philosophies. The professional therapists apply the nourishing balm of locally grown coconuts to soothe the body for a holistic well-being. Never miss a workout by achieving personal aims in the convenient all-day fitness facility overlooking stunning ocean views. The hotel promotes a variety of water-sports activities such as water-skiing, windsurfing and catamaran sailing, or discover the Maldives' diverse marine life. Situated on the Maldives' peace and tranquil North Male Atoll, the resort’s archipelago is a 20 minute speedboat ride away from Velana International Airport. When you land at Velana International Airport, after clearing immigration and luggage retrieval, please proceed to outside of the terminal building where a hotel representative will be waiting for you with a signboard of Banyan Tree/Angsana or proceed to the hotel counter (Zone B, Counter 7) at the airport. The representative will guide you to the Banyan Tree Lounge for a short break before escorting you to your boat which will take you to the hotel after a 35-minute ride. One child under 6 years is charged USD 65 per night when using existing beds. Please provide arrival and departure information when making your reservation or no later than 72 hours prior to arrival. In case of booking with breakfast included, you will be able to upgrade your meal plan on the day of your arrival. This can not be modified during your stay. Please contact reception prior to arrival if you wish to upgrade. The fees for the Gala Dinner (subject to a 23.2% tax) are as follows: USD 338 per adult for Christmas dinner on 24 December. Children receive a 50% discount. USD 400 per adult for New Year's Eve Gala Dinner on 31 December. Children receive a 50% discount. All additional charges must be paid directly at the hotel.